Here’s what Fred had to say about his newest acquisition. 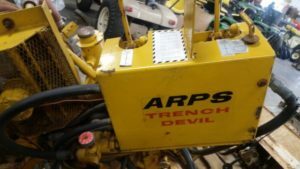 “Here are a few pictures of my latest Arps trencher. It is also a Model 1400 produced for a John Deere 140 lawn and garden tractor. 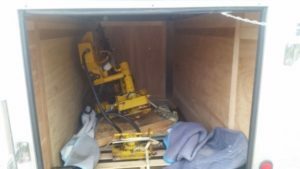 This one was found in Minnesota, originally shipped to an electrical contractor in Cedar Rapids, IA. Serial number 1031. It is 8 nos. 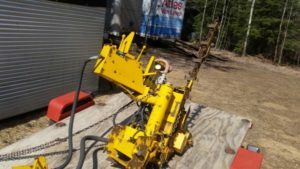 ahead of my other Arps 1400 Trencher. I am told by the previous owner who is a brother in law to original owner it was mounted on a 140 in 1969, used to trench about 150 feet and removed so tractor could do other work. 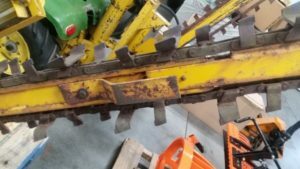 Owner thought it too much bother to reinstall the trencher and never used it again. So it is in real nice shape. Weathered some but was under a tarp most of its 48 years. It is now with us in Sioux City, Iowa and will go back on a 69 140 H3 sometime in Winter of 2017/2018. Also shown is our first Arps 1400 on our 1970 140 H3. And here are the pictures Fred sent me. You can see that the trencher looks to be in like new condition. 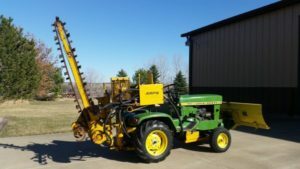 And, here’s the picture Fred sent me of his first Arps 1400 mounted on his John Deere 140.